Trito's Adventure is rated 3.5 out of 5 by 17. Rated 5 out of 5 by bbwyldflowers from Great Game! Where's the next chapter? I thought this game was great. Lots of fun, actually can be addicting. Trying to beat the levels with limited moves, lose by needing just one more move...that's frustrating. I kept running out of gems and boosters until I realized that I didn't have to use them. I would just play the level again, and again, if needed, until I beat it! I had over 1000 gems to work with and had stocked up on boosters enough to get through for a while, when I reached the end of this chapter. I've still got plenty of gems to boosters to start Chapter 2. Hope it comes out soon. I'm just an old lady who loves Match 3 with a bit of a challenge. Cute characters and storyline as well. Rated 5 out of 5 by LavenderLion from So much more then it seems! This review based on completed game. I bought Trito's Adventure as something to play when I needed a break from more intense games. And it was that: bright colors, pleasant music and its move limited so no need hurry. There is a light, easygoing feel to the whole game. The surprise was how much there was to the game. There are 275 levels! It has many different types of tasks: simple clear the sand, get character (Octy) along a path, objects to uncover and more. And they kept adding things throughout the game. I was surprised when a new type came along at about level 160, even more so when other new things showed up later. It never got dull. The under the sea setting was fun too. Instead of the bombs you have in other games there were sea creatures that did special things, like sea horses taking out a row of icons. And all with a sense of humor too - my favorite was the puffer fish who so happily blows up! And I enjoy the bonus creatures all going off at the end of the level like fireworks - sort of a reward for doing well. :) Recommend everyone give this "little" game a try. Its fun! Rated 5 out of 5 by luv2playBFG from great colourful fun! I really enjoyed the simplicity of this game. Colourful, and at times even challenging so I had to repeat a level or two to get it. Once I completed it I immediately started to look for similar games by the same designer. Cute storyline! Rated 5 out of 5 by s_tickle from Better than expected Well I thought a kids game but downloaded it. Was desperate for a new game so I bought it. I'm fast at these type of games and the free hour doesn't show you this games true color. It's actually challenging about 1 hr 15 mins into the game. Some levels are taking me 2 or 3 times. Of course not the hardest game but worth buying. I like limited moves, more relaxing when that's what I want. I cut down sound, I skip story lines, I'm just not at all into that, so I can't comment. But this isn't a kids game, would take someone 12 and up to play this. 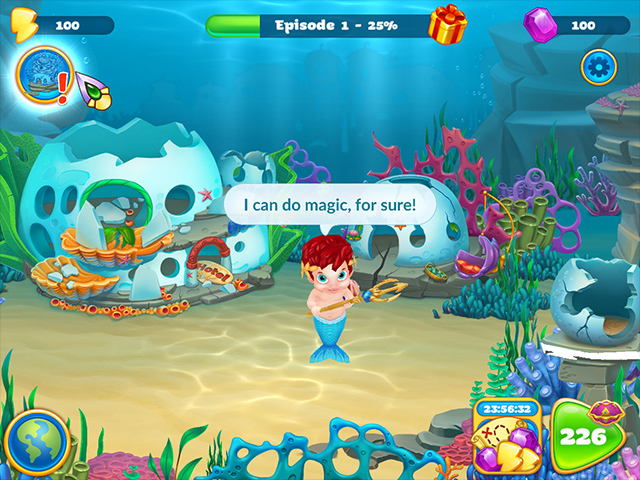 Rated 5 out of 5 by DivaBella from Fun Game for all ages Love this little game it reminds me of the fishdom series. Its cute & I like building things . It my be some what for kids but I'm a big kid at heart. Love anything to do with oceans. Give it a try I did & bought it rite after the trial. Rated 5 out of 5 by whoopcaterpiller from fun match 3 This is a beautiful little game, not just for children but everyone who likes match 3. Yes it is limited moves but for the most part the rounds are easily beaten in the moves given. I had the free version on my android phone for ages, i love it to pieces give it a go, don't let the limited moves put you off. It was a must buy for me. Try it you will enjoy it. Rated 5 out of 5 by twtscat48 from Join Trito's Adventure I thought this was a fun game to play. It's similar to pretty snails but better. You help Trito repair buildings by playing the match 3 in levels to win gems, bonuses to be able to get the buildings repaired, it is one that has so many moves to complete the stage. You gain enough gems to can purchase a bonus, it is easier to get through a stage then pretty snails. I played until the demo was done and purchased it right away. I recommend this game. 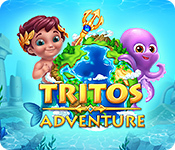 Rated 4 out of 5 by pennmom36 from BEAUTIFUL ANIMATIONS but... Trito's Adventure is a fun Match 3 game, but there are a few features it has that I didn't like. I will say though that this is the first game I've played (that I know of) from Bluembo Entertainment, and I have to give them a shout out for the amazing animations! I've seen some cute animated characters before, but these graphics are some of the best I have seen. I usually don't enjoy animated Match 3 games personally, so the fact that I enjoyed this game says a lot, and if a few features were tweaked, I'd say this would be an off the charts kinda game. These are just my personal preferences in a M3 game, so don't let that stop you from trying the demo, I think you should try this game in fact! Tito's Adventure is a Limited Moves game with a "builder" aspect, you play levels to earn enough Lightning power to recharge Tito's Trident so that he can restore all of the houses destroyed by a tornado, as well as complete some side quests asked of little Zeus junior. 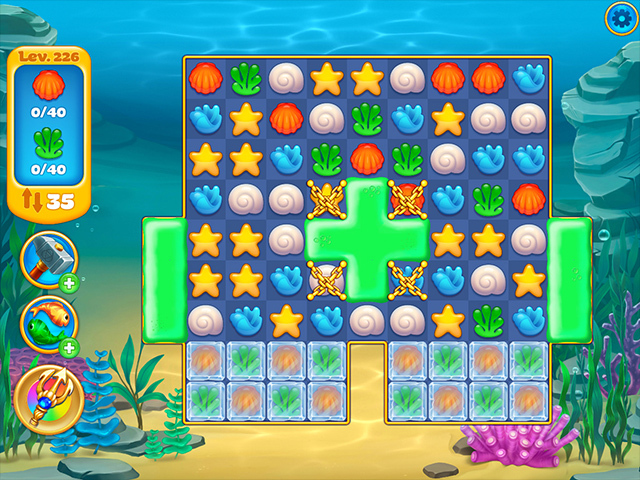 The goal of each level is usually to clear all Sand tiles, but some levels may require you to remove a specified number of specified tiles and complete some levels by clearing a path to allow Octy to reach the treasure. There are the usual Obstacles of Wooden Crates, Chained Tiles, Stone Tiles etc that block the Sand Tiles. 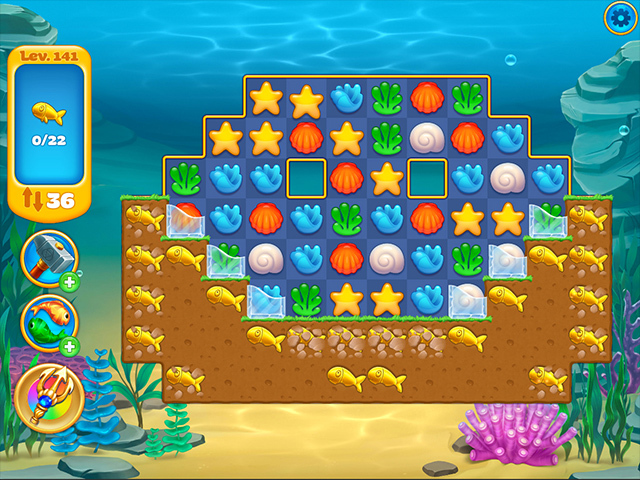 Large Matches will earn you Bonuses on the board such as Twin Seahorses that take out an entire line or row (depending on which way you activate them up and down or left and right) Explosive Crabs that explode to take out a small group of tiles, and even a Pufferfish that blows up an even bigger area when he huffs and puffs. There are also Bonuses that can be used once filled or purchased such as a Trident that removes all of the same tiles as matched with, a Hammer to take out a specific tile or Fishy Twins that swap any 2 tiles. Eventually, you will unlock Bonuses that can be used at the start of each level. A few features I didn't like was that after each level it takes forever because you have to wait as all unused bonuses explode and then all remaining moves added to the board. If I had the option to just click the board to end all that and quickly move on, would be a nice touch. I also didn't like that you had to pay 75 precious gems to add +5 moves to the board which seems a bit steep and that you can't replay levels whenever you want. Finally, I don't like that as you progress, it seems that the only way you can beat levels is to create and combine bonuses that wipe out the entire board. I actually like to try to beat levels without using power-ups and bonuses when possible. As I said earlier, these are just my personal preferences in a Match 3 game. It's a well developed Match 3 game and the developers deserve a lot of credit for their talents. Rated 3 out of 5 by MissMaddie from Not so much! This is not one of my favorite Match 3 games. The repetition of the dialogue and the goals is borrrring! I wish I had positive things to say. Well, the sound and visual quality is good...there you go. Not a buy for me.